The show started on Friday and I am late as usual. I managed to finish three little bears. Thinking of Christmas in the middle of summer heat was not easy but I think they all look very nice. Thank you for visiting and I hope everyone is having a good weekend. Once again an awfully long time since I have done a blog post. We are in the middle of summer and my hay fever and asthma have been dreadful, I need it to rain more often. Lots of bears have been made and gone off to their new homes. 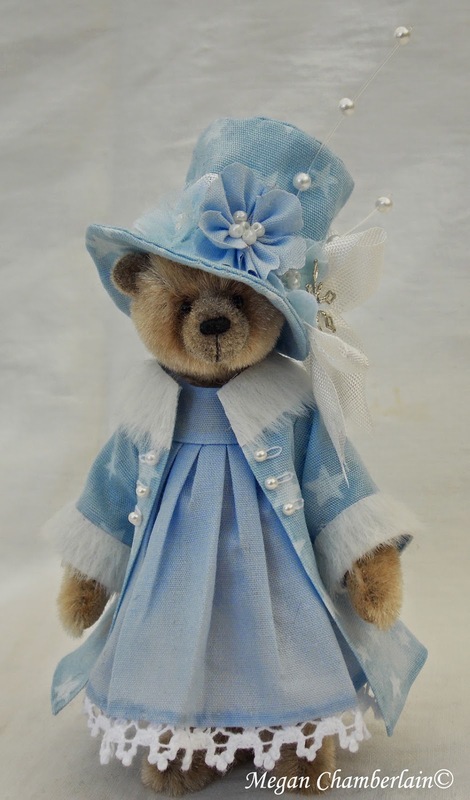 Forget-me-Not is on eBay at the moment, I really like how the embroidery looks on her dress. Inigo was a bear that I made a week or so ago. Obviously I am loving shades of blue at the moment. I have wanted an old Singer featherweight sewing machine for awhile now and last week managed to find one on eBay for a good price. We drove to Norwich to pick it up which was an interesting journey. Norwich looks like an amazing city so we are going to have to go back for a proper visit. One last piece of news, as near as we can figure out it is Belladonna's first birthday today so I have to show off what a beautiful little girl she has grown up to be. 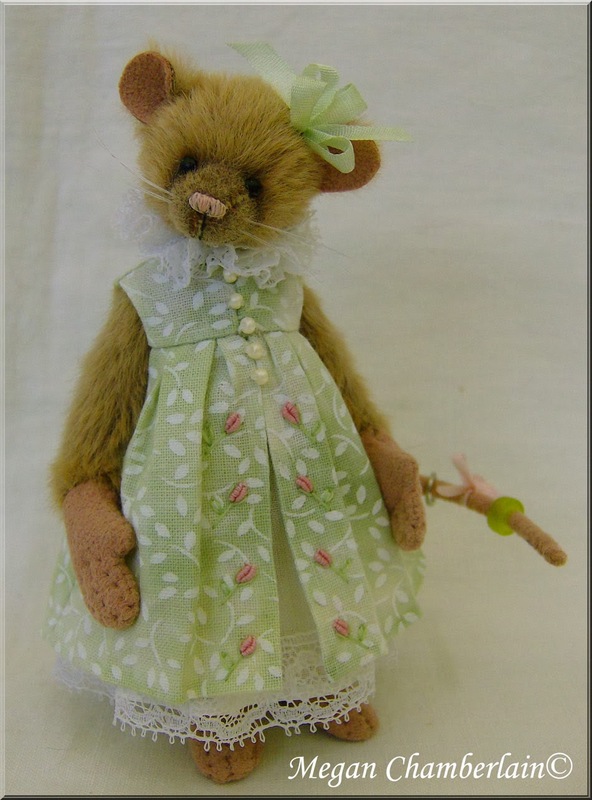 Winsome is celebrating Valentine's Day, I managed to finish her in good time and she is now on eBay. 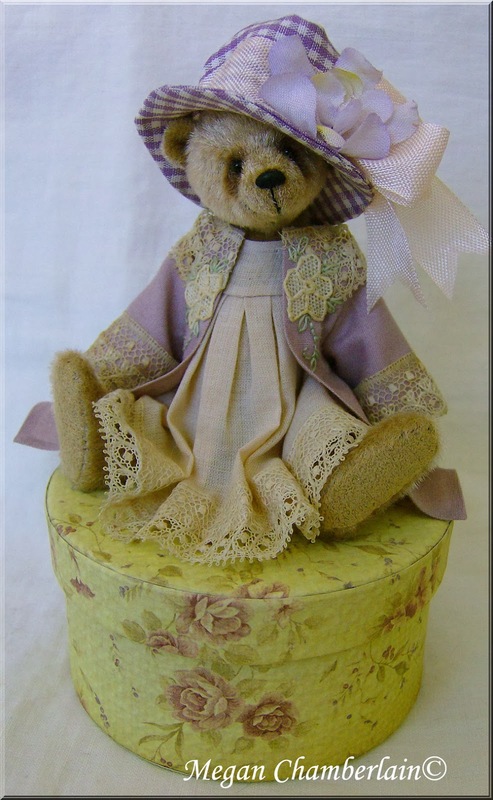 She is sitting on a pink and white dotted heart cushion with ribbon trim around the edge. I have finally managed to finish a new pattern and kit for the Etsy shop. 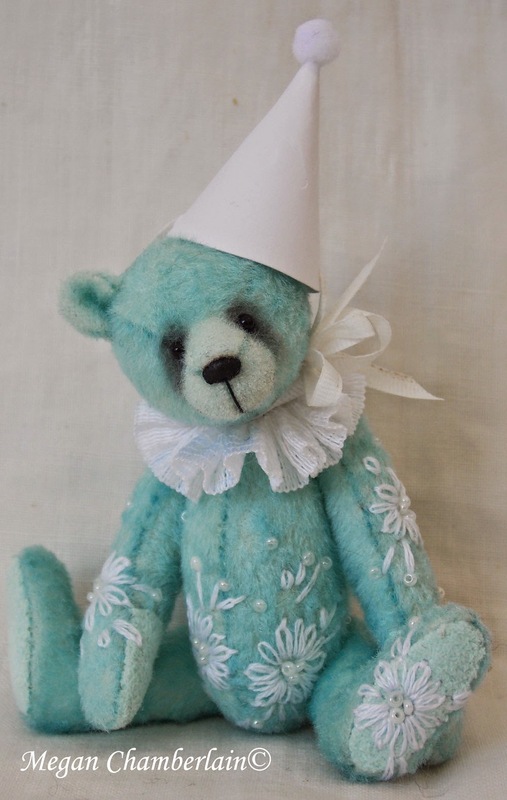 I even made this little boy in mohair which is very unusual for me as I really prefer working in the vintage long pile velvet that most of my bears are made with. This is Harvey, he has turned out really nicely and has a very cute face. 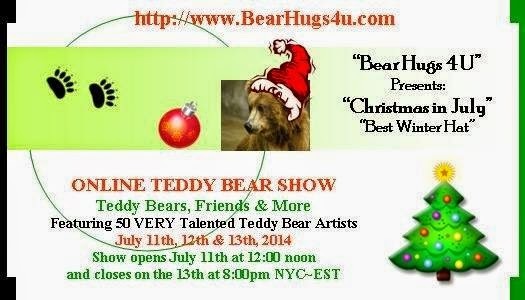 In August last year I designed a Christmas bear for the Australian Bear Creations magazine. Candy Cane is now featured in the latest issue and the kit will soon be for sale in our Etsy shop. My week has been quiet, just stitching and stuffing bear parts, planning what to make for the Hugglets show and a new bear is almost finished and ready for eBay. Photos will be shared soon, I hope everyone has a nice weekend. It has been a long and miserable month so far, the weather is turning us into ducks and my cough turned into a chest infection. After finally listening to my family and going to the doctor I am getting better. Now we just need some sunshine and things will start looking better. 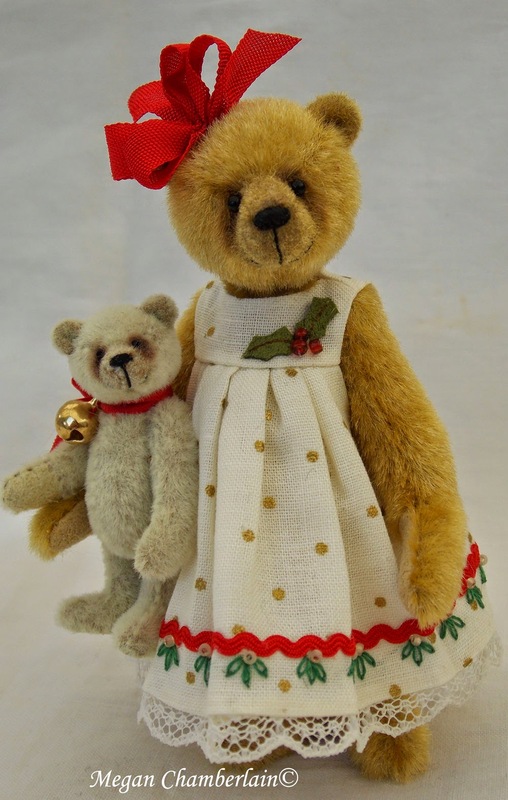 Annabelle is a new bear, recently listed on eBay. Sadly she didn't find a home so she is now on our webpage. This photo was taken a couple of days ago, a bit of blue sky before the rain started again. I finished a couple of bears and a rabbit for orders, a new pattern bear is almost done and now I have to stop ignoring the fact that the Hugglets bear fair is just around the corner. These are a couple of new photos to show you. 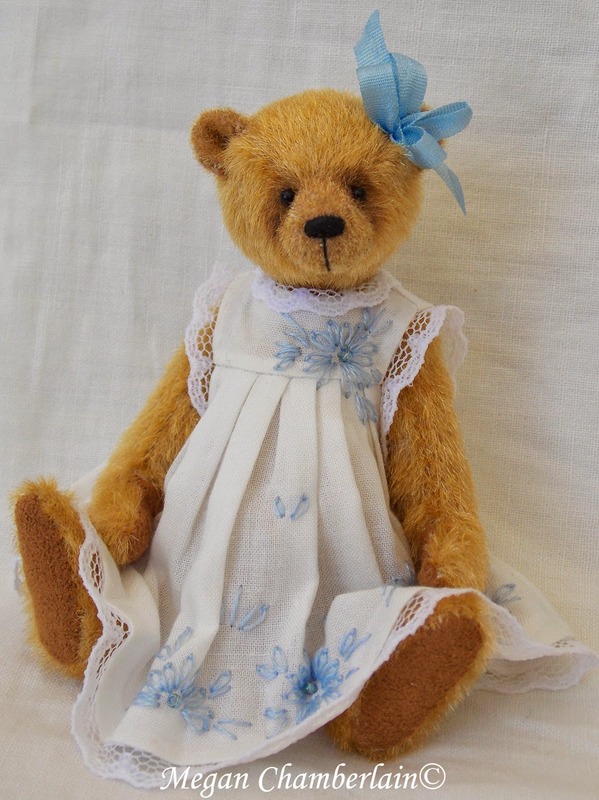 I love this picture of tiny Rose from our 2012 Anniversary set and Ella Rose was the last bear that I made for 2013. 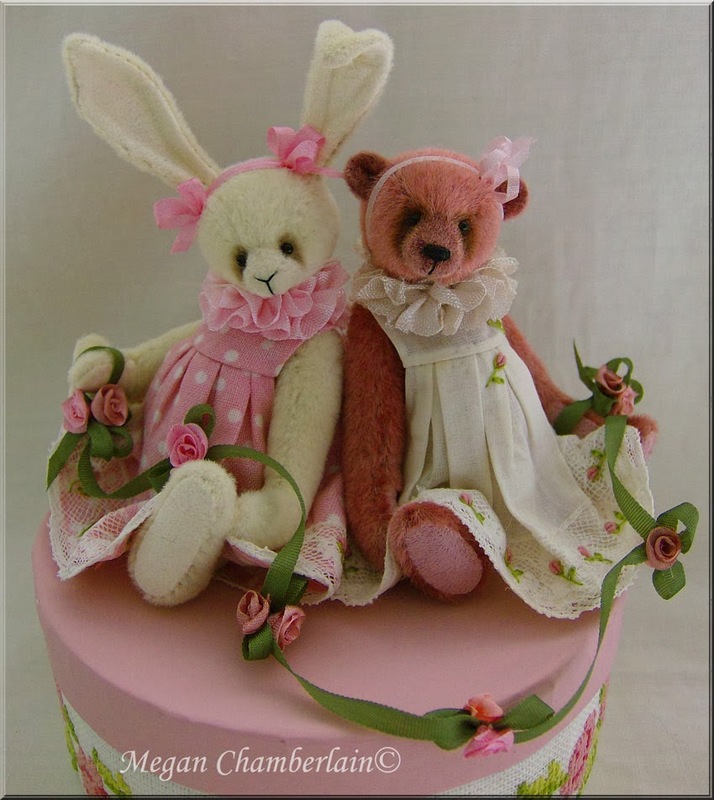 The new bears that I have been working on are orders or the online show preview which I can't show you yet, so I have a couple of my favourite bears from last year to share. 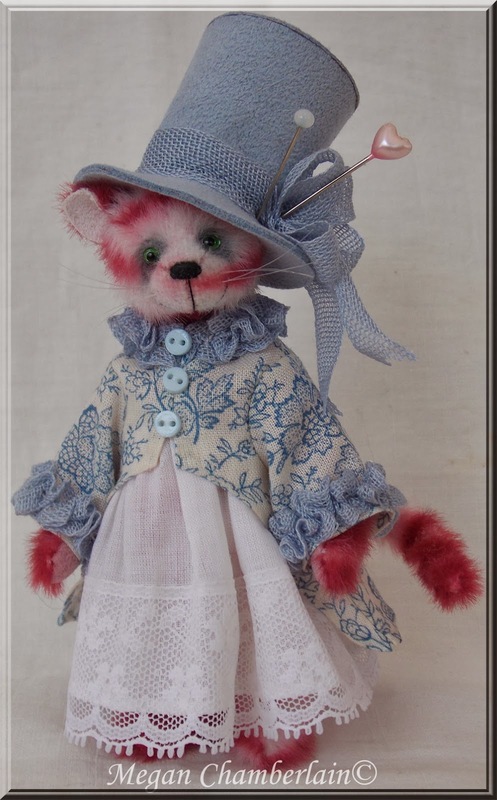 My favourite colour is pink as anyone who has followed my work for awhile will have noticed, so it goes without saying that a pink cat would have to be made. 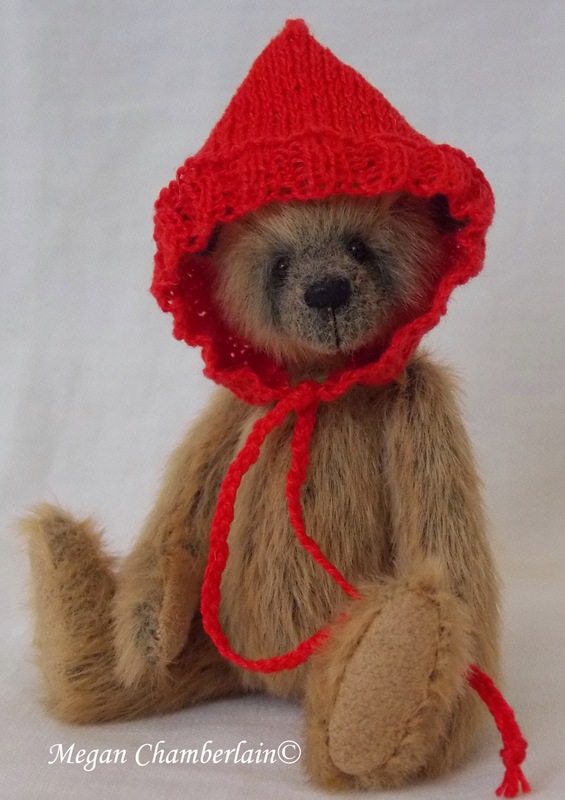 I have a bit of a cold which has given me an annoying cough but hopefully it will go away soon and in the meantime I am busy with a new bear for ebay and a new cross stitch SAL.